Just occasionally on its journey through space, the moon passes into the Earth’s deep shadow and turns red. The internet usually goes insane, and this January is no different in advance of Sunday/Monday’s rare celestial event. In the pre-dawn hours in western Europe, and in late evening in North America and South America, a total lunar eclipse will occur for precisely 62 minutes, though the entire event technically lasts for just over five hours. Some call it a ‘blood moon’, which suggests it turns a deep, crimson colour. It does nothing of the sort, looking much more like the colour of the sun during a sunset. Others call it a ‘super blood moon’ because this full moon is slightly closer to Earth than most full moons, so looks very slightly larger. It’s even being called a ‘super wolf blood’ moon because some Native Americans are said to have called January’s full moon the wolf moon. 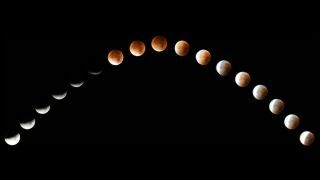 Whatever the internet has decided to call it matters not, for on January 21/22 a magnificent total lunar eclipse will occur for the third time in a year, but for the last time for many years. Here’s everything you need to know about this celestial grand finale. The media tends to hype up eclipses these days (something astronomers who’ve happily watched these events alone for decades absolutely hate), and this coming lunar eclipse is being called a super blood wolf moon eclipse. Its slightly bigger size is hard to appreciate because as the moon enters Earth’s outer shadow to kick-off the five-hour event, it will lose its full moon-like brightness and seem a weird muted grey. It will also be very high in the night sky, and without foreground or background the human brain lacks reference points, so has trouble figuring-out and comparing sizes. So in practice, you won’t notice any difference in the Moon’s size. Also, there are no wolves around the Moon! However, what you will notice is that the moon briefly (well, for 62 minutes) becomes a delicate, dynamically changing, and completely entrancing reddish colour, set against a sky full of stars. It’s a rare and unmissable sight. 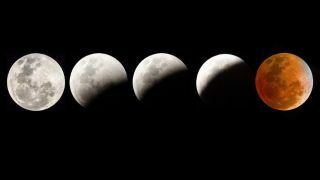 What are the stages of the super blood wolf moon eclipse? The process goes something like this: the moon will first enter the Earth’s outer shadow – its penumbra – and lose it brightness. Then it will begin to enter Earth’s central shadow in space, and become partially eclipsed. That’s a really weird sight, and worth seeing because only as over 50% of its disk gets eclipsed will you start to see the dark area turn reddish. However, it’s really only when the moon is totally eclipsed that it looks completely red because the human eye no longer has to cope with subtle colour in darkness and bright white in the same view. After 62 minutes of redness, the whole process goes into reverse. 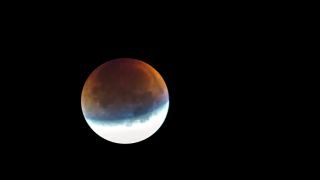 Why is the super blood wolf moon eclipse red? Blood-red? Actually, it won’t go blood-red. The phrase ‘blood moon’ has religious connotations and doesn’t accurately denote what colour our satellite will become when eclipsed. Rather than being a deep blood red, the moon will gradually turn a copper, then reddish colour, though the exact colour is up for debate. “We won’t really know exactly what colour the moon becomes until it happens,” says Tom Kerrs, an astronomer from the Royal Observatory Greenwich in London and author of Moongazing: Beginner’s guide to exploring the Moon. It will definitely turn reddish, but the depth of that color depends on particles in the atmosphere. “If there’s a volcanic eruption in January somewhere around the world, that would make the eclipse look even redder because it would fill the Earth’s atmosphere with dust,” says Kerrs. “As the moon sinks lower into the sky it takes on a redder, more orange color by virtue of the scattering of light in the Earth’s atmosphere,” he explains, adding that the presence of more dust changes how the Earth’s atmosphere filters light. “It would give us a deeper color,” he says. Either way, it’s a dynamic event, with the 62 minutes of totality displaying a wax and wane of various shades of red, orange and copper. What are the exact times for the super blood wolf moon eclipse? Exactly half the world can see this event at the same time, but while in Western Europe it’s an early morning event, in North and South America is occurs before midnight local time. Here are the times for lunar totality in some key cities and time zones that are well placed, with exact times for any location available (look for ‘total eclipse begins’ if that’s all you want to see). However, reckon on getting into position at least an hour before these times so you can see the partially eclipsed moon – it’s just as weird a thing to see as a completely red moon. For those in North and South America, look up. This is the highest total lunar eclipse for many, many years, so arguably the easiest to see in recent (and future) times – unless cloud blocks the view. Light pollution isn’t really an issue and it’s fine to look from your back garden or yard, though the darker the sky the more you will appreciate it when the bright stars of winter (particularly the sparkling Beehive Cluster near the Moon that night) become visible around the red Moon during totality. Standing somewhere where there’s no direct light is a good idea (so switch off torches and flashlights, car headlights, kitchen lights, and stand away from street lights). You need no special equipment, though binoculars are a massive help for seeing surface on the detail of the moon – it’s going to be pretty dim – and any small telescope or zoom lens on a camera massively helps. When is the next super blood wolf moon eclipse? 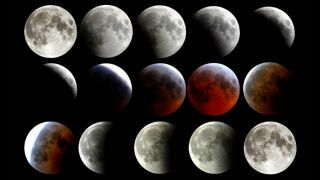 As discussed, the name is mostly nonsense, but the next total lunar eclipse – almost identical to what you will see on January 20/21 – will next occur in May 2021 (for North and South America) and May 2022 (for Europe). So enjoy this spectacular satellite while you can!